“Gee, Oh Gosh, I’m Grateful!” Words by Michael Carr, music by Max and Harry Nesbit (1934). Recorded by Sam Browne and “Girl Friend” (i.e. Elsie Carlisle), accompanied on the piano by Eddie Carroll and Bobbie McGhee, in London on March 2, 1934. Regal Zonophone MR 1254 CAR2593-1. “Gee, Oh Gosh, I’m Grateful!” was a collaboration between composer Michael Carr, who wrote other songs that Elsie Carlisle recorded, including “The Little Boy That Santa Claus Forgot” and “You’re in My Arms,” and the music hall comedian brothers Max and Harry Nesbit. In this 1934 Regal Zonophone recording, the song is a duet between “Sam Browne & Girl Friend.” The identification of “Girl Friend” as Elsie Carlisle is universally accepted on the strength of aural evidence, and the pair performs “What’s Good for the Goose is Good for the Gander” on the other side of the record. The scenario laid out in the lyrics of “Gee, Oh Gosh, I’m Grateful!” is a light and simple one: a bachelor and a single woman are out walking when their sudden attraction to one another coincides with a rainy downpour. No sooner has the chivalrous man shared his umbrella with the woman than…they are married with a house and baby — a quick and amusing transition. A comparable use of weather to bring potential lovers together can be found in the following year’s “Isn’t This a Lovely Day (To Be Caught in the Rain)?” sung by Fred Astaire in the Irving Berlin musical film Top Hat. 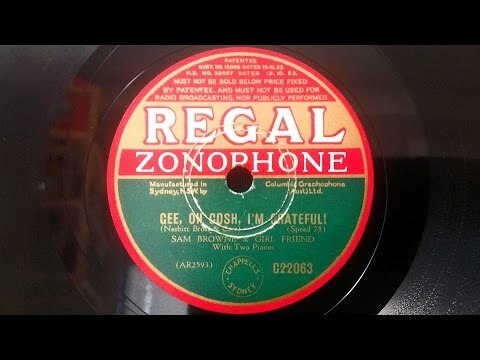 “Gee, Oh Gosh, I’m Grateful” was recorded soon afterwards by Ambrose and His Orchestra (v. Sam Browne) and by Roy Fox and His Band, with Denny Dennis as vocalist.